Security Compliance | BlackHatWing, Inc.
BlackHatWing can ensure compliance of your endpoints thru continuous monitoring of your environments adherence to a golden image or standard configuration. This golden image can be quickly defined by pointing to a real system or created custom by you. BlackHatWing can leverage known standards such as NIST and CIS policy definitions and supports PCI-DSS, HIPAA, SOX, FISMA, GLBA and other regulations. > With enhanced visibility and control, BlackHatWing also enables exclusions to policies based on IP basis. BlackHatWing consultants have proven expertise in Data Loss Prevention solution consultancy, enterprise wide deployment and assistance. We provide assistance in creating an effective enterprise wide DLP program. We pride ourselves in providing a vendor neutral point of view in understanding and selecting a suitable DLP solution addressing your business, operational and IT requirements as well as your financial constraints. Following international standards and compliance means there are minimal chances of losses. BlackHatWing enable organizations to be proactively planning for their business continuity and any possible disaster recovery. 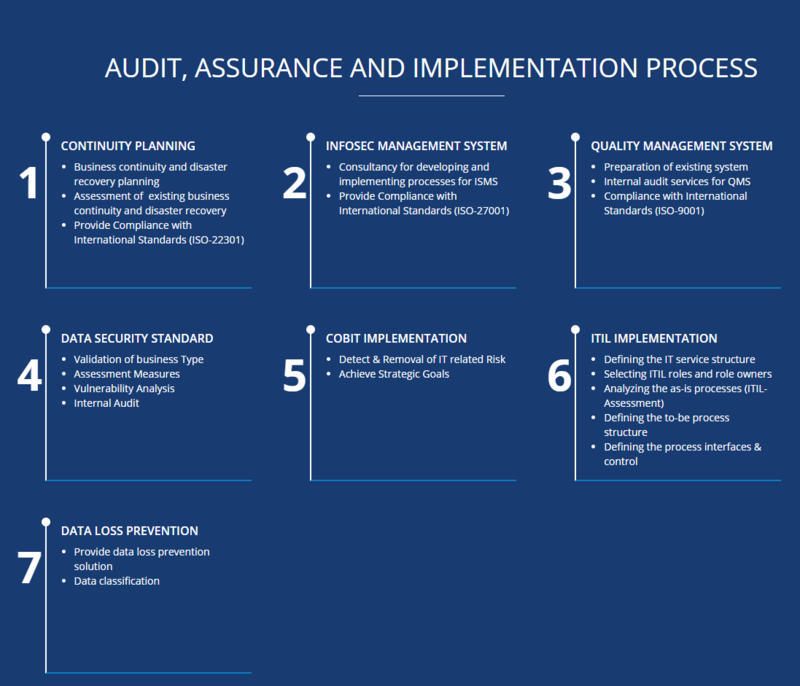 Our experienced consultants with their backgrounds as CISA, CISSP, BS25999, ISO 27001 Lead Auditor, ISO 9001, 27001, 20000 Internal Auditors, develop standard practices for organizations to avoid any possible disaster. We bring together decades of experience in the field of Information Security, Business Continuity Management, Service Management, Quality Management, Auditing, Process Improvement, Implementation, Consultancy & Trainings. ISMS ISO 27001 is standard for securing asset of organization and applicable to all sectors of industry and commerce working on electronic systems. This International Standard has been prepared to provide a model for establishing, implementing, operating, monitoring, reviewing, maintaining and improving ISMS. ISO 27001:2005 (ISMS) is a structured and systematic approach to manage information and information assets of the organization by maintaining confidentiality, integrity and availability. BlackHatWing works with their clients to establish a secure, transparent, organized working environment while sharing expert knowledge and experiences for developing and implementing processes for ISMS. BlackHatWing works with their clients to establish a secure, transparent, organized working environment while sharing expert knowledge and experiences for developing and implementing processes for ISMS.